Our chickens have been leading us a merry dance for some weeks now. The number of eggs in the nesting boxes seemed far too few, but we had not been able to find any eggs out and about; until today. I let them out this morning and saw one of the heading off particularly purposefully. 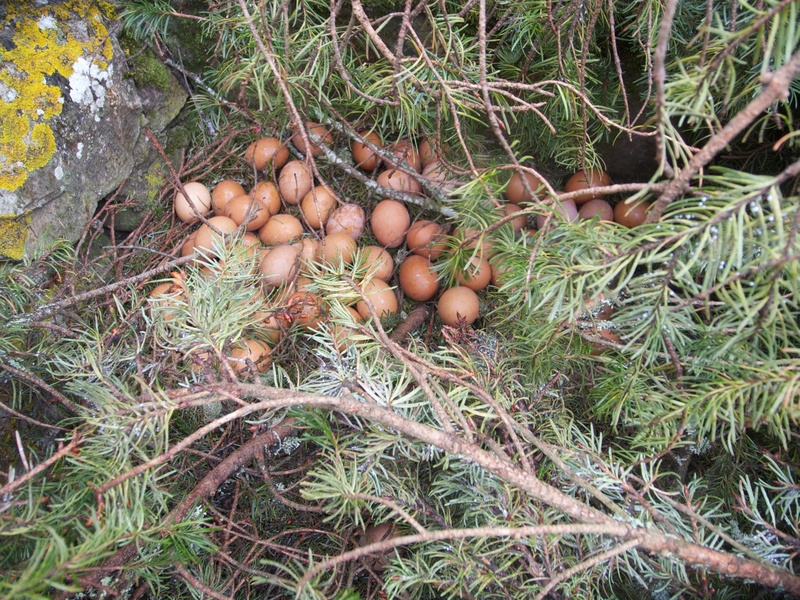 A little later we spotted her jumping off a wall and when we went to investigate we found some fallen branches and no less than 74 eggs piled up underneath. We took then all home and tested them and I’m pleased to say they were all OK. Ice cream seems to be the product of choice for rapidly using up excess quantities of eggs, so I suspect the ice cream maker is going to be working flat out this afternoon! This entry was posted in Uncategorized and tagged Croick, Croick Estate, eggs, hens. Bookmark the permalink. It seems your chickens are at it again. 2 years ago whilst staying at the old Manse our children found over 80 eggs laid amongst the bulrushes in the field next to the manse. The children could not believe their luck, to them it was like finding treasure! The eggs were also all fresh after testing! Alistair was dumbfounded when we told him. He thought they had gone off laying. He kindly let the children have eggs much to their delight. Those hens are so friendly and very much part of Croick now. Hope the weather will be good this summer to enjoy the ice cream.